when first appeared beasties of fur and of feather. Artistic view on the life in the Triassic period by Richard Morden. Get it here! This artistic map shows the supercontinent Pangaea and the Tethys ocean. 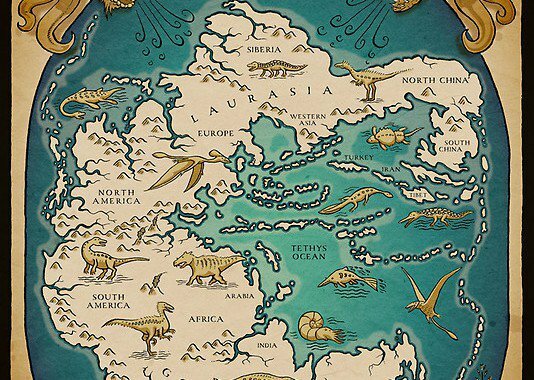 It’s a surprisingly accurate depiction where the landmasses of today were in the Triassic period. Pangaea resulted from the collision of the two major continents Gondwana and Laurussia, surrounded by the great panthalassic ocean. 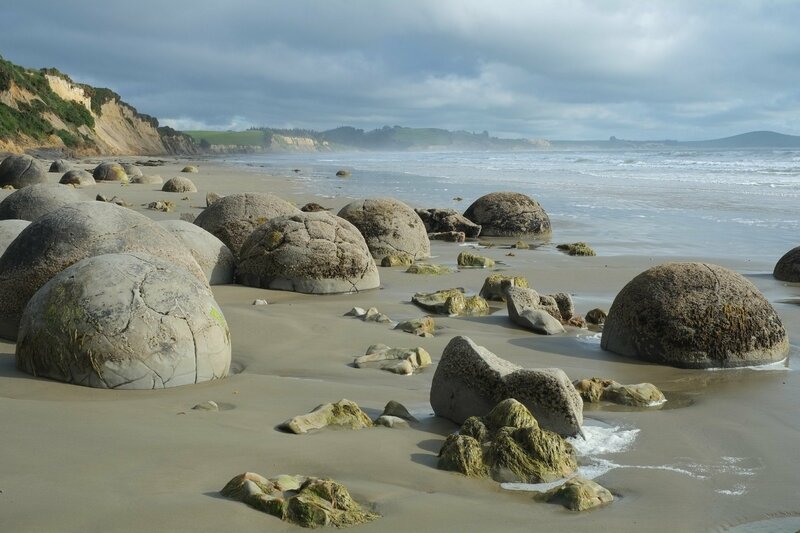 We’re looking at a time after the Perm-Triassic extinction. It took another 30 million yearsSahney, S., & Benton, M. (2008). Recovery from the most profound mass extinction of all time Proceedings of the Royal Society B: Biological Sciences, 275 (1636), 759-765 DOI: 10.1098/rspb.2007.1370 for life to redevelop into it’s beautiful diverse complexity and it was the start of an era. The dinosaurs inhabited Earth. They’re not quite drawn to scale, but that’s artistic freedom. We can find Ichthyosaurus South-East of the lettering Tethys Ocean, which was a highly successful marine predator. Down in “Antarctica” South of Pangaea, you can find a shark-like lifeform. In case, you didn’t know, yes sharks are some animal that happens to be around a little longer. Martin, R. Aidan. “Geologic Time”. ReefQuest. On land, we can find the first known flying reptile, the pterosaurs, just between Europe and North America. The other species on two or four legs resemble quite a few images I found of Proterosuchus, Cynognathus, Coelophysis and the famous Plateosaurus. However, I’m not an expert here and someone else would probably be better at pointing out the different species that resemble those drawings. And on the bottom we see a couple of plants. On the left those resemble the first “palm ferns” (Cycads) which depict the rise of gymnosperms in the Trias and there are even some Pleuromeia. On the left, we see different species that can be placed in the marine flora. 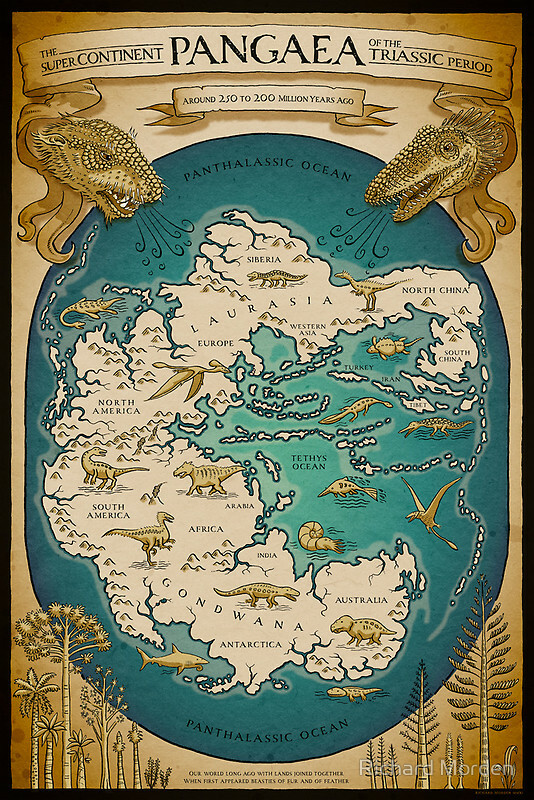 This map is incredibly detailed and a wonderful artistic interpretation of the state of science on the Triassic period. You can get it in print from Richard Morden on redbubble. I will go and read up on the PLoS collection on paleontology you can follow me or have a look over to itsokaytobesmart.com where I found this piece of art. Posted in Earth Science, Images, Maps and tagged art and science, geology, geoscience, paleontology.